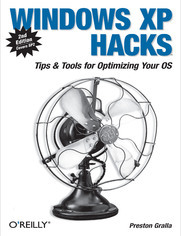 You'll also find timesaving hacks for file distribution; digital media, such as iTunes; and high-visibility web software, services, and exploits that have emerged since the book's last edition. Each hack in the book can be read easily in just a few minutes, saving countless hours of searching for the right answer.Now completely revised and updated to cover Service Pack 2 (SP2), the second edition of this bestseller carefully breaks down the new features that come with SP2, including IE pop-up blocker, Windows Firewall, and the new wireless client.Written by Preston Gralla, the compact and affordable Windows XP Hacks, Second Edition provides direct, hands-on solutions that can be applied to the challenges facing XP beginners, as well as the more experienced power user. Each year, Windows XP is pre-installed on 90 million PCs worldwide, making it the world's most popular operating system. 6.5.1. Getting Yahoo! Mail with YahooPOPs! Hack #76. Test Your Security with Shields UP! 10.10.3.1. I want my CDs! 13.7.1. Remember the Boy Scout Creed: "Be Prepared"